The International study tour is every student’s dream and aspiration in a B-School. A getaway for a month with a partially paid scholarship is an offer too good to refuse. 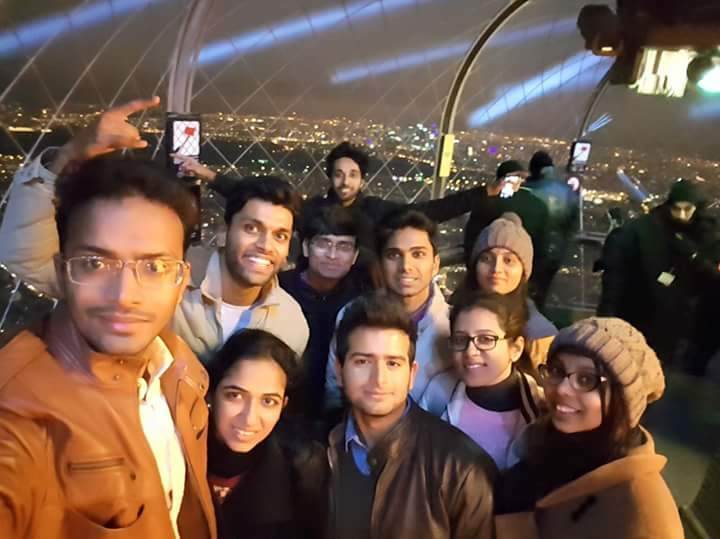 I was one of the lucky ten to be selected for the Winter Study Tour Programme to Telecom Ecole de Management, Paris (TEM, Paris) from Shailesh J. Mehta School of Management (SJMSOM), IIT Bombay. The anticipation and excitement for the tour started when the list was first announced and all ten of us had to prepare for the VISA and other documents. After countless hours of paperwork and sleepless nights, we were finally ready to depart from India on 27th November 2017; the ten globetrotters – Ankita, Kodi, Rishabh, Shivangi, Lionel, Aman, Utsav, Disha, Piyush, and Sruthi were ready to cover 8 countries and 13 cities in a span of 30 days. Now for the exciting part! We set our foot in Europe for the first time in Rome, there are two things which immediately comes to our notice – Cleanliness, “Crowdlessness”. It is amazing to look at a city so organized and picturesque; to have everything move in a clockwork fashion! We have heard of “When in Rome, do as the Romans do” but the irony is that the Italians are loud, talkative, overfriendly and very hospitable people just like Indians. The Europeans had a leisurely way of living; they took care of their 4Fs – food, fashion, family, and friends. It was pleasing to see families, kids and large throngs of tourists in the Colosseum and the Forum, to trace the footprints of long forgotten kings and royalty, to hear the stories of gladiators, exotic dancers, animals and their display of valor, conquers and dynasty in Ancient Rome. Our next two cities were Florence and Pisa. Florence is a quaint town with thousand-year-old Cathedral di Santa Maria as the central church. The whole town was tiled and still sported old-fashioned horse carriage, musicians in street corners, glow of red and golden Christmas decorations and the faint aroma of Christmas confectionary lingering in the air. The leaning tower of Pisa is a massive cathedral square where the tower was originally built on a marshy ground causing it to lean off the normal at 5.5-degree elevation. We spent the whole day taking millions of photos, choosing souvenirs to take back home and eating the best Italian food we can find. I could go on writing about the trip, but I would like to stop here and leave it to your imagination for the lack of words. In TEM School of Management, we covered a plethora of subjects from conflict management to Game Theory. There was no one session which did not have a student engaging activity/simulation to enforce the concepts learnt in the classroom. We had good interaction with the students doing their Ph.D. and learnt about European Tax and Employee laws, international culture as a part of the curriculum. Overall the study programme was academically enriching, the preparation for the whole trip was done solely by the team which gave us an opportunity to work as a team, manage international itinerary in real life, overcome all the sticky situations and make the most out of the winter. Overall, the trip gave me an opportunity and perspective to understand where I stand as a Manager – both personally and professionally.